Every now and then I like to make pasta fatta in casa (home made pasta). 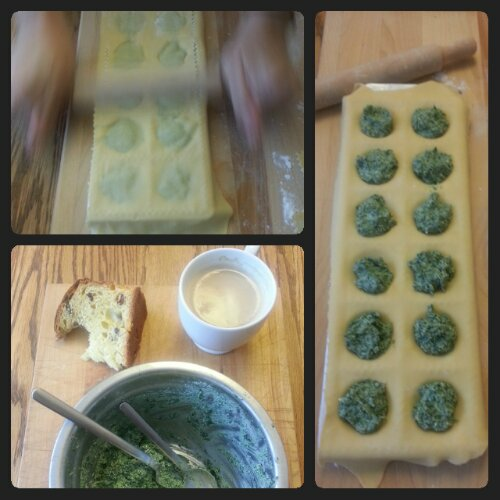 Yesterday I prepared some ravioli di magro, the classic ravioli filled with spinach and ricotta. 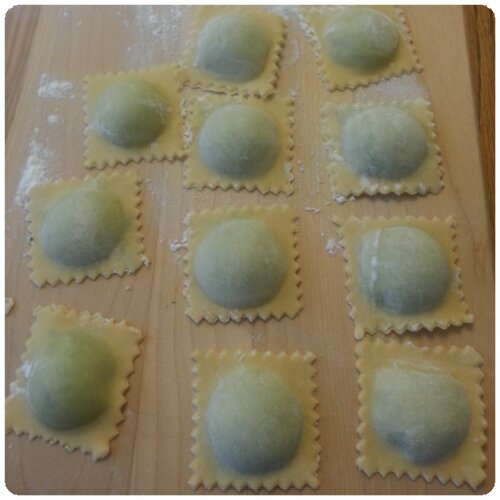 A rainy Sunday morning is the ideal time to make some ravioli. And… yes while working at these ravioli I was having a cappuccino with Panettone! If you make some extra you can freeze them and you can cook them, in boiling water, when they are still frozen (you do not have to thaw them before boiling them). With these ingredients I made 42 ravioli. Mix the flour with the eggs and knead the dough until it becomes very smooth. Wrap the dough in cleat wrap and let it rest in the fridge while you prepare the filling. Steam the spinach and let them cool down. Squeeze them very well to take away as much liquid as possible. Finely chop the spinach with a chef knife. In a bawl, mix the spinach with the ricotta and the grated parmesan cheese. Using a pasta machine, flatten the dough to the smallest thickness. You will need to do this gradually, in four or 5 steps, starting from the larger thickness (number 1) all the way to the smaller one (number 8, on my machine). Fill the ravioli as you flatten the dough otherwise the dough will dry and will not stick well when you close the ravioli. Freeze the ravioli, if you like.